For the 21% of Iowans living on low-incomes, having warm coats for their family is a costly luxury. Frigid weather has started once again. Sieda Community Action is working with community partners in Ottumwa to help keep our friends and neighbors warm this winter. Thanks to all the wonderful donations, 579 adult and 338 children’s coats or jackets were given last winter. We are sure this will be another great year. ‘Share the warmth’ winter coats are hung at Sieda’s Wapello County Resource Center at 725 West Second Street, Ottumwa. Sieda is collecting all sizes of new and gently used coats for men, women, and children. 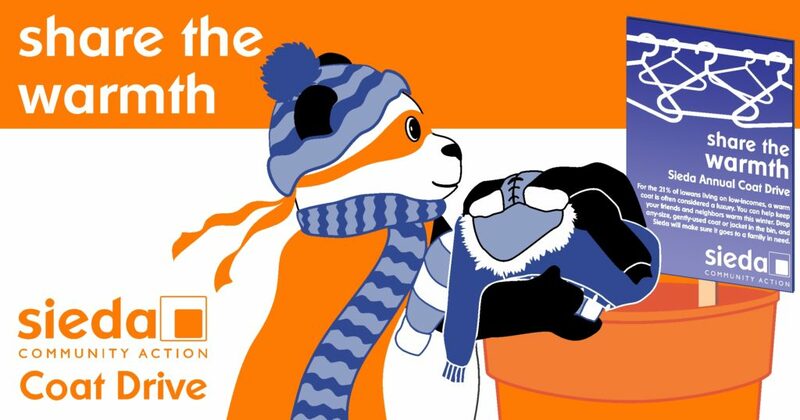 Please drop-off coats in the orange bins located at the following Ottumwa locations. If your business or group has collected for the coat drive please drop them at our 725 West Second Street, Ottumwa location. Sieda Wapello Resource Center at 725 W. Second St. Thank you to our other supporting locations, John Deere, Seton Catholic School, and other locations that wish to stay private.